Eliminates the negative aspects of chlorine usage. The Better Way To Do Chlorine!!! Using a Salt Chlorine Generator, in a pool. The use of a salt chlorine generator is a more effective and convenient way to use chlorine, as compared to traditional chlorine products. It eliminates many of the odor problems, associated with chlorine and ends the handling, measuring and storage of chlorine. In-line and no-installation-required models, are available for all types of pools. 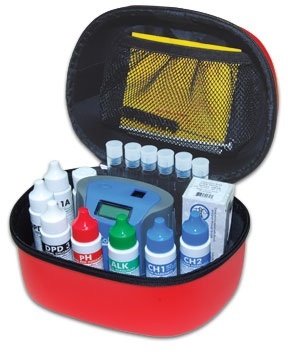 A PockeTester Kit is a convenient way to monitor the salt level, as well the overall water chemistry. How to use a salt chlorine generator, in a pool? Salt Chlorine Generators, also referred to as Salt Chlorinators, Saltwater Chlorinators or Salt Chlorinating Systems are actually miniaturized chlorine manufacturing plants: the same technology is utilized. The devices work by electrolytically converting salt, in the pool water, into chlorine as it passes over specially coated titanium electrode plates. Salt must be added to the pool prior to start up, as directed. Thereafter, salt need only be added occasionally, to replace that lost due to splash out, pump outs or backwashing. The device generates Free Chlorine and destroys odorous and irritating chloramines, as the water passes through the cell. Chlorine production is controllable by a setting and the equipment operates in conjunction with a timer. Properly used, there is much less sensation of chlorine being present. The other water analysis parameters must be maintained, as with any chlorine-maintained pool. It certainly is easy-to-use and convenient and lends itself to pool automation. If problems arise, refer to the Pool Problems Page, as a source of problem-solving information, broken down into various categories. Scroll down the page and click on the linked keywords, catch phrases or images, in the archived answers below, to access additional information, on that topic or product. ► Do I Need To Add Chlorine Stabilizer? I am a pool rookie. I am in northern New Jersey with a small above ground pool. It is salt water with a salt water generator. I just added the salt and it is dissolving now. My question, for a small salt water pool, should I be using a stabilizer? If yes, how much? You should add chlorine stabilizer. Otherwise, the Sun's UV rays will destroy the chlorine. This will make the salt chlorine work harder and will shorten the life of the salt cell. Add enough to raise the level to 50 PPM. I can't tell you how much to add, because I don't know your pool size. This page should help: calculating chemical additions. I hope that the information provided was helpful. If this website was helpful, in solving your problem, please consider joining our E-Letter Mailing List. You'll receive E-Letters, with helpful information, new product updates, suggestions and sale announcements. I hope that I have provided the solution. Dear Alan: We are considering a salt water chlorinator. Could you answer a few questions. Is this a reliable pool water sanitizing method? Is it easy to use? Will it save money? Do you favor a particular brand? Are there any negatives? Thank you for the help. A salt chlorine generator is a more reliable a sanitizing method as any other form of chlorine. The big difference is that it avoids or reduces a lot of the chemicals and makes the overall pool water chemistry easier to maintain. You'll find that there is less handling and storing of chemicals. So far as the economics are concerned, I really don't have all the information necessary to make that determination. However, I would suspect that it will be quite favorable over time. But the convenience factor is significant and almost without comparison. A salt water chlorinator is one of those products that can be controlled by a pool automation system: another convenience plus! My long-term, personal experience with the product was very satisfactory and I know that the product category has been improved considerably over the years. The quality units incorporate some of the best technology and have cells that should provide extended service. ► Extending The Salt Cell Life? I was told that there was a way to make a salt cell last longer. Is there? Actually there is, apart from operating the unit properly, maintaining the recommended salt level, adding chlorine stabilizer and keeping the overall chemistry within acceptable limits. The salt cell is slowly exhausted, as chlorine is produced. If you add a backup sanitizer, such as a solar-Powered, dual-ion, purifier-mineralizer, you will need to produce less chlorine, in order to maintain any given level of chlorine. In other words, the salt chlorine generator is not working as hard and the salt cell will last longer. In addition, you should find the pH easier to maintain, within limits. Should the chlorine level bottom out, due to heavy bather use, you will have the benefit of a backup sanitizer. I hope that this information will prove helpful. ► Switching From A Copper-Based system To Salt? Using a non-chlorine product and a chelated copper product, in my above ground pool and want to change to a salt chlorinator system. Do I have to change the water? You might want to test the copper level. Because salt chlorine generators operate at a higher pH, you want to make sure the copper is under 0.3 PPM. If over 0.3 PPM, you should add a dose of Liquid MetalTrap or use a MetalTrap Filter. Unlike organic phosphonic acid products, Liquid MetalTrap is phosphate-fee and is a true chelating agent, that still functions, at pH levels above 7.8. The organic phosphonic acid products do not perform well, when the pH is 7.8 or higher and these higher pH readings are common with a salt chlorine generator. Otherwise, you are good to go. A salt chlorine generator!!! It is chlorine without all the negatives. No chlorine odor, no handling, storage or buying chlorine and much better water quality. You'll have to buy some salt - common, non-iodized food grade or water softener grade - inexpensive! Thereafter, you need to add more salt only to replace that lost through pump out, splash out, backwashing or overflow. With a salt chlorine generator, all you need to do is add an initial dose to stabilizer to bring the level up to 40-60 PPM. Thereafter, more stabilizer is needed only to replace that lost through pump outs, backwashing and splash out. The overall water chemistry should be maintained in the usual manner. Because salt chlorinators destroy chloramines so effectively, you will find the swimming conditions more pleasant and easier to maintain. A Salt PockeTester is ideal for maintaining the proper salt level, which helps assure proper performance and longer cell life. ► pH And Total Alkalinity Issues? My pool store told me that our pool needs Total Alkalinity Increaser, but the pH is 7.9, acid demand is 2, total alkalinity is 100, adjusted alkalinity is 67, stabilizer is 100 and salt is 3000. Wouldn't this recommended Increaser cause the pH to go even higher? Shouldn't I be adding acid instead of alkalinity? Thank you. Your pH is slightly above range and I would not choose to add TA increaser. The dealer is subtracting 1/3 of the CYA reading from the TA reading: this technique is really only an approximation. The pH is already high and adding TA increaser will only stabilize the already high pH. Inasmuch as your salt chlorinator tends to raise the pH, I would pay primary attention to the pH and not worry about the TA, unless there are other problems. pH is always more important than TA. You can simplify the optimizing of the pH, by adding an automatic pH Controller. It will add acid, as needed, to maintain a preset pH. Using a Solar-Powered Mineralizer, in addition to the salt chlorine generator will allow you to get by with a lower production rate of chlorine and this, in turn, will lessen the impact on the pH and TA. I hope that I have helped. We are planning to put in an inground pool and are thinking of using a Salt Water Chlorinator. Can you tell me what you know about the differences between the salt system versus chlorine? Is one safer than the other for small children? You know how they sometimes swallow water, get it in their eyes and have sensitive skin. Thanks. With a salt chlorine generator, there are no chlorine products to store or handle and no chlorine products to leave exposed to children. In either case, the pools will be maintained on chlorine. With a salt chlorinator, the chlorine level is controlled by a setting on a dial, avoiding uncomfortably high levels that might exist, when chlorine products are manually added. Chloramines are an irritating and odorous form of combined chlorine and are a problem in most chlorine pools. However, with a salt chlorinator, all of the chloramines are destroyed, as the water passes through the cell. Your overall pool maintenance will be simplified and fewer chemicals will be required. Everything about this type of product is kid friendly. You can pretty much say goodbye to "red eyes." I hope that I have been of assistance. ► Above Ground Pool Usage? My brother has a saltwater chlorinator on his inground pool. Can this type of equipment be used in an above ground pool? Pool size is about 10,000 gallons. Any idea about cost? Can I use a timer? Thanks. Saltwater chlorinators can be used with all types of pools. Smaller units or units especially designed for above ground pools are available Two units, suitable for above ground use, are available. These are generally smaller and less expense, than those intended for the larger inground pools. One unit requires minimal installation and the other is solar-powered, requiring no installation at all. The models will treat pools up to 15,00-20,000 gallons. Every pool will be different depending on size, time of year, type of usage, exposure and other factors. A larger capacity unit is always preferable, as it is better able to keep up with peak-season demands. I hope that this information will prove helpful. ► A Rising Salt Level? I have a Tracer PockeTester (ordered from your website) which I use to monitor the salt levels, of pool with salt chlorine generators, on my service route. I never got around to putting one on my own pool, in the 3 years since it was built, although I do like the convenience. Out of simple curiosity, I tested the tap water and found a salt level or 600 PPM. That is not uncommon for this area. I tested my pool water and found a salt level of 2000 PPM, which came as a major surprise. I have never added any salt and only use lithium and trichlor, in the pool. Is there an explanation? Evaporation!!! There is nothing wrong with the Tracer PockeTester. Finding high levels of salt or TDS is nothing new and affects most pools, that are a few years old. You can lose 2-inches of water a week. Possibly more, in the summer, in your hot dry location. A 2-inch loss represents 2-3% of the total water volume, depending on the average pool depth. Even allowing for rainfall to replenish some of the loss, you are still adding about 10 PPM of salt, every time, you top off the pool, with the water containing 600 PPM of salt. At 10 PPM weekly, for 3 years, and you can easily reach 2,000 PPM of salt: almost as much as some pools with salt chlorine generators. If you were using liquid chlorine the salt level would probably be close to 3000 PPM. The levels are not enough to taste, so it goes by unnoticed, so long as the overall water chemistry is good. If the pool did have the salt chlorine generator, with water containing the appropriate amount of salt, the levels would rise by the same extent. When the salt level or TDS gets too high, water should be replaced. Thank you for writing an for encouraging me to put it to the numbers test. ► Concern About High TDS? I apologize for forgetting to ask you this in the first email, but I do have one more question for you regarding saltwater chlorinators. It has to do with TDS (Total Dissolved Solids). The N.S.P.I standards for TDS are ideal: 1000-2000 ppm, and maximum: 3000 ppm. Since, for a saltwater chlorinator, you need at least 2500 ppm of salt alone, how does that square with the N.S.P.I standards? What kind of problems can occur if your TDS are too high? Thanks. Good question. The TDS standard does seem at odds with the requirements of a salt chlorinator. The standard is a guide and is based on the TDS being composed of various calcium and sodium carbonates, bicarbonates, chlorides, sulfates, cyanurates and other minerals. Some of these salts have limited solubility, especially at higher pH and TA. In order to avoid cloudy water and scaling, the TDS is recommended to be capped at 3000 PPM. TDS readings are usually expressed as PPM of sodium chloride, even though the dissolved salts are not sodium chloride exclusively. Being that sodium chloride is quite soluble, the addition of 2500 PPM or more should not present a problem, even in areas with relatively high TDS. It certainly presents less of a problem than the addition of various chlorine compounds over time. High TDS can be a problem, when a major portion is due to calcium as opposed to sodium salts. Saltwater chlorinators are very popular in high TDS areas such as Arizona. I would not expect any problems, except with some extraordinary poor quality water. A Salt and TDS PockeTester will help you to monitor the situation. I hope that I have cleared things up. With a salt chlorine generator, monitoring the overall water chemistry and the salt level is very important. Testing helps prolong salt-cell life and helps assure bather comfort. This all digital tester tests for Salt, TDS, pH, Free Chlorine, ORP and Temperature, without any chemicals and using only a single water sample. Simply easy!!! 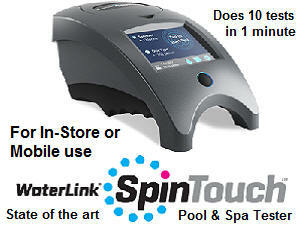 A ColorQ all-digital tester will do all the routine pool or spa water tests. In most cases, all you need is the ability to test for Free and Total Chlorine, pH, Calcium Hardness, Total Alkalinity and Cyanuric acid. There are a variety of models, to suit your specific needs. Easy-to-use. No more color matching or guess-work! Does not test for salt. This waterproof test meter measures salt, TDS and temperature. The tester’s probe is dipped into a sample of pool water and the results are ready instantly. This PockeTester measures the Sodium Chloride level, within a range of 0 to 9,999 ppm. TDS is measured from 0 to 9,999 ppm & Temperature from 32.0 to 149°F. This Professional-Grade Test Kit, provides all the testing, you should require. The #1749 PockeTester digitally measures salt, TDS levels and Temp. The Insta-Test PRO 600 Strips tests for Free & Total Chlorine, Bromine, pH, Total Alkalinity, Calcium Hardness and Cyanuric Acid. The Insta-Test PRO Phosphate Strips measure phosphates. ► Corrosive Effect On Equipment? I am getting estimates on installing a pool and one of the pool builders said a salt generator is hard on the equipment and would not recommend them but prefers a Chlorine and Ozone system. What is the impact of the salt system on the equipment? What impact? The only problem might occur if two dissimilar metals were in immediate proximity to one another. After 25 years or more the equipment manufacturers know this and have designed the equipment accordingly. Some lower quality stainless steel ladders or rails could be affected. I suggest that you use 316 stainless steel or even better would be a ladder and rail made of composite material. It will be chemically resistant, easy to maintain and won't get hot to the touch. Use the combination of chlorine and ozone and you will have good water quality. But, you will have to take care of the chlorine level, store chlorine and handle chlorine. Or you could go with a salt chlorine generator and get great water quality, without storing or handling any chlorine. You will be able to control the level with the press of a button or the turn of a dial. That could be why 90% of the pools in Australia have salt chlorine generators, as well as most new inground pools, in the US. I hope that I have been helpful. ► Salt Chlorine Generator And A Solar Cover? Hello Alan, I have a quick Q? I have a pool at the moment and balance my pool the conventional way of adding chorine and checking the readings. Adjusting again, until correct and repeating this every few days, depending on usage etc. However I am about to purchase a salt chlorinator. But, I want to know when I set my machine to the recommended level in the literature. Do I need to adjust it because I use a polyethylene bubble cover? I know my cover saves chemical but the salt chlorinator literature I have seen says nothing about bubble covers? Any advice? The manufacturer's recommendation is just a starting point. Every pool is different, needing more or less chlorine as the w ater temperature and season change or usage varies. Apart from the other pool chemistry parameters, you want to maintain a free chlorine level of 1-3 PPM, with the total chlorine being, ideally, less than 0.3 PPM higher. The cover might help save on chlorine, but it will raise the water temperature. The higher water temperature will require more chlorine and the pleasing water temperature could increase pool usage, as well. Therefore, you need to monitor the chlorine and vary the settings, as the season progresses. Expect the pH to rise and require regular additions of acid. For testing purposes you might consider a ColorQ PRO 7 digital water analyzer. Salt levels do not vary on a short term basis, but need to be monitored, at least once or twice a month, as level that are too high or low can cause problems. For salt testing a digital salt tester is as easy as it gets. I hope that this will help get you off on the right track. ► Starting Up: Stabilizer and Chlorine? I just ordered a waterproof Tracer PockeTester, Salt, TDS & pH, from your website, and am filling and starting up my new saltwater spa for the first time. In the directions for the chlorine generator, it says I need to not only add sufficient salt, but also stabilizer and chlorine. Is this really necessary? I hope to get the tester soon. Thanks. Have a good Thanksgiving. The directions make complete sense. The addition of the chlorine stabilizer will help the chlorine last longer, by protecting it from the Sun's UV rays. You're starting off without any chlorine. Adding some will help prevent algae growth and make it easier for your salt chlorine generator to maintain the right level. A level of 1-3 PPM, of free chlorine, would be ideal. In short, it avoids having to play catch up. Enjoy the holiday and the pool. Thank you for the order. ► Must I Use Stabilizer? My question, if the main purpose of cyanuric acid is to stabilize chlorine. why do I need to add it if I have a salt water pool that is constantly adding chlorine thru out the day? From what I have read, cyanuric acid is one of the things that irritates people, especially my 5 year old daughter. I switched to a salt water pool to take the chlorine jug out of the pool guy's hand, so my blond haired daughter's hair doesn't turn green. So why do I need cyanuric acid, if chlorine is being introduced to the pool every day? Thank-You. You might be able to get away without adding stabilizer. In the summer, your salt chlorine might be hard pressed to supply the pool's chlorine needs. However, there is a price to not adding stabilizer. Because you are producing more chlorine, the salt cell will not last as long. The more chlorine you produce, the more the pH will require downward adjustment with acid. Most issues, with cyanuric acid, involve the high levels, that result from regular use of stabilizer chlorine. It can reach 200 PPM and higher, if not monitored. In your case, you merely need to do a one time addition of 40 PPM. If you have a heater, the green hair is more likely due to copper, from the use of copper algaecides or from corrosion of the copper heater core, if present. Add some quality metal treatment, such as Liquid METALTRAP and see if that doesn't eliminate the problem. Because the pH will always tend to be at the higher end, copper heater corrosion should not occur. The stabilizer choice is yours. There is another choice here: add an ozone generator. Because it also provides oxidation, it will allow you to set the salt chlorine generator, at a lower setting, extending the life of the salt cell and making pH control easier. It is an ideal combination, especially when both units are full sized for the pool. I hope that this information proves helpful. Hi Alan. Your site has been MORE THAN HELPFUL to me in the past few weeks! THANKS YOU SO MUCH for all of your helpful advice. We are having a salt chlorinator system installed on our 25,000 gallon pool in two days and I am so excited! I have learned so much from your site, that I feel confident in maintaining the salt system with virtually little effort. My concern is in the establishment of the system. The pool professional we chose does not know a lot about salt systems, but he says he is learning. My biggest question is in initial startup - how much salt to add and what else needs to be done for the initial startup? Once again, THANK YOU for hosting your site and answering all these questions. I will recommend you to all my friends with pools. Sincerely. Thank you for the kind comments about the website. I can't provide an exact figure on the salt requirement, as it does vary according to the salt chlorine generator manufacturer. You should check the instruction manual to be sure. It will require something in the neighborhood of 25 pounds per 1,000 gallons of water. Use non-ionized food grade or water softener grades of salt. Do not use rock salt or industrial grades! It is important to have it within a certain range, so make sure that you use the correct dosage and pool volume. Test the level to be sure. Thereafter, you need to add more salt to replace that lost through pump outs, splash outs and backwashing. Chlorine stabilizer levels of 40-80 PPM are acceptable. The only other thing that I suggest is the addition of a dose of a quality, metal treatment, such as phosphate-free Liquid METALTRAP. This can help avoid discoloration, if metal are present and, at the very least, will help keep the cell clean. Keep tabs on the pH, as it can tend to rise. This is basically a chlorine pool without chlorine to handle or store. Good luck and I'm sure that you'll enjoy the product and appreciate the difference it will make. Enjoy the season. We have a 16 x 32 inground pool with a "SALT" system. We have had to add salt in November and December and on both occasions once the salt was dispensed it has left a discolored stain in the area where the salt was poured. The color is not black but a light brown. The company where we purchased the pool has been of minimal help. If you have the slightest bit of information please let us know as this pool is only 5 months old and I am trying to save the liner. Thanks. The staining that you are describing is not something normal or inevitable. There are several possibilities: the salt was of industrial quality and contained trace metals such as iron, the pool water contained low levels of iron and, perhaps, the addition of the salt and the resu ltant high TDS caused the iron to precipitate or the salt was not distributed around the pool and/or was allowed to remain in prolonged contact, without the benefit of being stirred. This type of staining could have been caused by the prussiate of soda in the salt. This is an anti caking agent, present in some grades of rock salt. In either case, I would try adding a dose of phosphate-free Liquid MetalTrap to the pool and try to remove the stains (most likely iron) by applying acid. To do this take a white sock with 1/2 pound of pH decreaser powder and drop it onto the stained area. Leave it in place for a few minutes and slowly move around with the vacuum pool. Hopefully the acid will dissolve the stains. You can also try a similar technique using METALTRAP Stain Remover. Periodic addition of a dose of Liquid MetalTrap, will help prevent staining and, in addition, help keep the salt chlorinator plates free of scale deposits. I hope that this information will prove helpful. Best wishes for the new year! Editors Note: not all grades of salt contain prussiate of soda (iron containing anti-caking compound). It may be present in rock salt. While staining or discoloration problems aren't inevitable, avoiding salt containing the additive will help reduce the possibility. In any event, always spread the salt around the pool perimeter, keep the filter running, engage the main drain, use the pool vacuum to promote better bottom circulation and use the pool brush to stir things up. If a dose of a quality metal treatment is added a few hours prior to the salt addition, the likelihood of the problem should be lessened and will afford the additional benefit of helping to keep the plates scale-free. Most metal treatments contain organic phosphonic acid, which can degrade to create a phosphate problem. In addition, these products lose effect at a pH over 7.8, which is common with a salt chlorine generator. Liquid MetalTrap is a true chelating agent and works over a very wide pH range. ► Salt Level Dropped Suddenly? We have a mineral/salt unit using salt. The mineral reading was 2400 and then the next day the mineral reading fell to 0. We took the unit off and cleaned it in a diluted muriatic acid bath. Then we reinstalled the cell but it is still 0. Any ideas? This mineral reading is just the PPM of salt. It cannot go from 2400 PPM to 0 PPM overnight. Cleaning the cell plays no role in being able to test the salt level. Something is wrong with whatever you are using to test for salt. I suggest that you replace the tester, as it is not functioning properly. There are many, convenient ways to test for salt. The salt chlorine generator works best when a proper salt level is maintained. Always use a non-iodized food or water softener grade of salt. Never use rock salt or salt containing yellow prussiate. I hope that I have been of assistance. I have a salt system and I am adding 50 lbs of salt a week to maintain a 3200-3500 level. I have done a bucket test and no leak is detected, plus my water bills are low. My pool is an 8500 gallon pool. What may be the problem? Thank you. If the facts in your letter are correct, there are only two possibilities. #1. The method used to measure the salt level is incorrect and/or unreliable. #2. You have a leak and are losing something on the order of 1500-2000 gallons of water weekly. There are no other possibilities that will account for the need to replenish the salt weekly. The salt recycles itself and the only way to lose salt is by pump out, backwashing or overflow. You should only be requiring about 50 pounds a year, more or less, depending upon your pool equipment and circumstances. Perhaps, heavy rainfall is disguising the leak, but it is there! You need to locate the leak or account for the salt loss. It could be in a pipe, seam, drain, return fitting, skimmer, cutout, etc. You might want to give FIX A LEAK a try. If it works, it will save you a lot of time and expense. Otherwise, you might consider calling in a leak detection professional. I hope that this information will you understand the problem and help you solve the riddle. ► Operating A Salt Chlorine Generator In A Winterized Pool? Good day. Love Your website! I have closed my pool for the season and plan on running my filter 4 hours a day, and salt water chlorinator 2 hours per day. I have the pool covered and live in a climate that does not freeze. My question "Is it okay to keep the water super chlorinated during these months for algae growth, or should I keep the water at the lower summer levels?" Regards. Salt chlorine generator do not perform as intended, when the water temperatures drops below 55-60°F. It may not be producing enough chlorine, at normal settings. Using traditional chlorine products, you should keep the chlorine level at 1-3 PPM. Once a month, boost it to 5-10 PPM, just to prevent sanitizer resistant microorganisms, from developing. This will definitely make the springtime opening easier. I hope that this will be helpful. ► The Effects Of Lots Of Rain? I live in the Houston, Texas area with a 20,000 gallon in ground pool. We are considering changing to salt chlorination, but have frequent heavy rainfalls that require dumping several inches of water out of the pool into the storm drain system to restore the pool level. We can get 4-6 inches of rain in an hour once or twice a year, and get 3 inches or more an hour once a month. Would having to drain this much water out of the pool this frequently make it difficult to maintain the salt level required for salt chlorination? How does one test the salt concentration after a heavy rainfall and draining? Thanks! You will have to make allowances, if you pump water to waste, as that will lower the salt concentration. Each manufacturer has a given range for optimum performance. Some units have low salt indicators. Testing salt is easy with a Tracer Salt PockeTester. Just dip it in the water. Salt chlorine generators are a big step forward from ordinary chlorine. I hope this information proves helpful. ► The Right Kind Of Salt? We are in the process of considering an in ground pool. Our sales person has told us about the salt water generators. At this point I do not know what kind or brand they recommend. Some of the answers you have given says not to use rock salt and that is what she said was used. I sure don't want to start out using the wrong kind. Does she not know what she is talking about? When you refer to food grade are you referring to table salt? And am I reading you correctly that it is 20-25 lbs of salt to 1,000 gallons of water? Our pool will be 16 by 30. That sounds like a lot of salt to me. Is there an therapeutic sides to using the salt water system? We're excited about getting started but want to cover all our basis before we make a decision. Thanks for your help. My recommendation not to use "rock salt" is based on the fact that this material can contain yellow prussiate of soda, which is added as an anti-caking agent. You're right it does take a lot of salt, but not enough to taste. Ocean water is about 17 times saltier. Given the large quantity, you do not want to add salt with yellow prussiate of soda because that can cause iron staining to occur. To make sure that staining does not occur, it is suggested that non-iodized food grade or a water softener grade be used. The small additional cost can save you lots of problems, with your salt chlorine generator. You were wise to check into this matter and try to get off on the right foot. Good luck with the pool. I hope that I have helped in the decision making. I been reading up on salt chlorinators and have purchased a mineral/salt unit. They suggest using their proprietary product as the salt. This is very expensive at approximately $30 for a 30 lb bag. They suggest one bag for every 1000 gallons. Do you know anything about this system and do you know if I can use other salt instead? Thanks. All salt chlorine generators work on the principle of electrolytically breaking down salt (sodium chloride) into chlorine and other byproducts. All salt chlorine generators are not the same, but so far as I know all, without exception, require that a salt concentration within certain ranges be maintained. Again, so far as I know, all salt chlorine generators can utilize either non-iodized food grade salt or water softener grade salt. Salt containing yellow prussiate of soda or rock salt should not be used, because of the presence of undesirable materials. The modest price of non-iodized food grade or water softener grades of salt is one of the factors that make ownership of a salt chlorine generator attractive and economical. While different water supplies might require additional additives, this is best addressed based on a water analysis and the pool's actual needs. I hope that I have been helpful. I have a salt system and I have a reading of 4800 ppm. I would like to know what a need to lower the salt to 3000 ppm? My pool is 11,144 Gallons. Your help is greatly appreciated. Regards. Salt Chlorine Generators do not require a high salt cutoff or warning and can operate, with higher levels. However, the life of the salt-0cell may be shortened. Your concern about excessively high salt levels greater than 6,000 PPM, should be directed towards metallic fixtures such as handrails, ladders, light rings, or heat exchangers. Higher salt levels will approach the taste threshold of about 3,500 PPM. To lower the level to 3,000 PPM, you need to pump out about 3,200 gallons of water or drop the level to about 6,966 gallons, taking care not to pump out too much water at a time, as this might cause problems in high water table situations. To avoid the possibility of pools popping up or vinyl liners floating, it may be safest to pump out the water in smaller increments. In either case, replace the pumped out water with fresh water. However, if the taste is not objectionable, the salt level can be left at its current level. It should dissipate, as time goes by, without any damage to equipment. I hope that I have been helpful. I have looked through your site, but couldn't find an answer to the question of what to expect with a salt chlorinator regarding water taste and feel. Will the water be salty at all? Thanks. It is there, but not easy to find. You will not be able to test the salt. It will only be about 1/17th that of ocean water. Most people agree that the feel of the water is better and more to their liking. If you don't tell them - they won't know why the water looks, feels and smells better! I hope that this is what you were looking to hear. I have a salt water pool. I read somewhere suggesting that I could use "regular mill salt" in substitute of a weekly renewal salt product. What is "Regular Mill Salt"? Is this the same as Water Softener Salt pellets? If not, where can I buy this "Regular Mill Salt"? Thanks. I am not familiar with the term "regular mill salt." However, so far as I know you can use non-ionized food grade or water softener grades of salt with all salt chlorine generators. Just do not use rock salt or salt with yellow prussiate of soda. The salt concentration should be maintained within the recommended limits, by the addition of salt, on as needed basis and as determined by the result of a salt test. Salt can only be lost through overflows, splash outs and pump outs. It does not get lost through evaporation and it is recycled after being converted into chlorine. Weekly additions of salt, especially without testing, can lead to having too high a concentration and that can damage the salt cell. I suggest that you test the level at the start of the season and occasionally, thereafter, and add salt to adjust the level to within the recommended range. I hope that I have been helpful. Is there a special grade of salt for use with a salt chlorine generator? I know that I will have to add quite a bit and am wondering if it can be added all at once? Thanks for the information. It is best to use a non-iodized food grade or water softener grade of salt. Avoid using "rock salt" or technical grades, as these may contain unwanted minerals or additives, such as yellow prussiate of soda (anti-caking agent). While you can add the salt all at once, you should disperse it around the pool perimeter. Keep the filter operating, until it is all dissolved. If there is a main drain, split the water intake with the skimmers. If there is no main drain, use the pool vacuum, as a temporary main drain. Use the pool brush, periodically, to stir up the bottom. Try and avoid allowing the salt sit in one small area. After everything is dissolved, adjust the overall water chemistry. Periodically, test the salt level, as replacement amounts might be necessary to make up for losses due to backwashing, pump outs and splash outs. I hope that the information proves helpful. Enjoy the season. ► Effect Of Low Water Temperature? We have an salt chlorination system. We have recently opened the pool for the summer and the local temperatures have been between 40°F at night and 80°F in the day. The pool water temperature is staying between 58°F and 67°F. The water looks fine, but when tested, no chlorine is registering on the test strips. The chlorinator reading on the Pool Pilot reads at times from 30% to 74%. Do we need to do anything to the pool to insure we have adequate chlorine in the water. How does water temperature affect the production of chlorine in a saltwater system? Some salt chlorine generators have an Automatic Temperature Compensation feature that will regulate the output setting of the Digital based upon water temperature changes. When water temperatures decrease, the output % will decrease, to the point that at 55°F or colder, it will show 1% and will not allow you to raise it any higher, in order to protect the cell. As temperatures warm up, the output % will then increase to maintain the chlorine demand of a warmer pool. The chlorine lasts longer with cooler weather, therefore the automatic temperature compensator adjustment is down. Most other systems rely on the homeowner to adjust the output as the temperature fluctuates and tends to over-chlorinate when it gets cold. This is actually good for those systems, as it will also shut down when it falls below 55-60°F. You have to be careful that the chlorine level is not too excessive as it will cause damage to equipment. If you add some chlorine or shock manually, in order to control algae, try and keep the level no higher that 1-3 PPM, until the water starts to warm up. I hope that I have been helpful and enjoy the season. ► Hard Pool Water Choice? I'm having an in-ground pool built in Cyprus. It measures 8 x 4 x 1.5 metres, approx 11000 gallons. Somebody has suggested a salt water chlorinator and is pushing to sell one that requires 7000 PPM of salt and is not self-cleaning. However, the water is very hard and someone else has suggested an in line brominator. Which system would be best. The house in Cyprus is a vacation home and I won't be there all the time, as I reside in the UK. There are pool maintenance firms who manually maintain pools. I would appreciate your advice. Kind regards. A salt chlorine generator that requires 4000 - 7000 ppm of salt and is not self cleaning, is at a distinct disadvantage in very hard water situations. Salt chlorine generator systems are available that typically require 2500 - 3500 ppm of salt, are self cleaning and use less power. Disadvantages of the high salt levels include being closer to the taste threshold, higher replenishment costs and higher potential for corrosion. Non self-cleaning cells will require periodic manual removal of the cell, for cleaning purposes, and are less suited for pool automation. An in line brominator will introduce byproducts, that will build up over time, and must be considered a potential problem in very hard water situations. Bromine is more costly to start with and cannot be protected from degradation by the Sun's UV rays. My choice would be a salt chlorine generator. I hope that I have helpful with the decision making. We recently purchased an above ground pool late last summer and are thinking of switching over to a salt generator before this summer season. We asked our pool dealer where we bought the pool and they said that salt generators will bleach the liners and rust the metal. They also stated that in the hot summer months (we live in TX), that the salt generators will not be able to produce chlorine fast enough to keep up with the algae production. Is this true? Salt chlorine generators are far less likely to bleach a liner, than are chlorine-based chemicals, because the chlorine is produced at a lower, steady and more consistent rate. In addition, there is no longer direct contact between the liner and a slow dissolving chlorine. The salt is in the water and contained within the liner. The only metal subject to corrosion will occur, if two dissimilar metals are in immediate proximity to one another. If the salt chlorine generator is properly sized, it should meet the needs of the pool. During periods of high temps and heavy bather use, it may be necessary to add a quick-dissolving chlorine to supplement the production. Under these same conditions, it can be a real challenge to keep a steady, comfortable level with conventional chlorine. Salt chlorine generators are commonly used with above ground pools. Using a Solar-Powered Mineralizer, in addition to a salt chlorine generator, will provide persistent sanitation, allowing the need to less chlorine to be produced and making the control of the pH easier. There are several salt chlorine generator units that are especially well suited for above ground pools, of all sizes. Many require little or no installation. I hope that I have been helpful. I installed the Model SR Salt Chlorine Generator yesterday in a 13x25 x48", above ground pool. What a snap! How does the generator "know" how much water to supply chlorine to? In other words, if a 10,000 gal and 20,000 gal pool both have the same amount of NaCl in ppm, why doesn't the 10,000 gal pool end up with twice as much chlorine in the water? Do you recommend any type of test strips or kits in a NaCl pool? Thanks. It doesn't! That's what water testing is for. There is no way to avoid it. How much chlorine a pool requires is not just based on pool size, but on weather conditions and bather usage. As the season changes, so will the chlorine requirements, but a salt chlorine generator makes it so much easier. Two bathers in a pool, require just about as much chlorine, for treatment of their wastes, in a 10,000 gallon pool, as in a 20,000 gallon pool. If the free chlorine level gets too high or low, you may have to adjust the settings or run the system for longer periods of time. Glad the installation went easily. I recommend the ColorQ digital water analyzers, as they provide complete chlorine information, easily and reliably. The question was a good one, as I hope the season will be. We have a large inground vinyl liner pool - about 44,000 gallons. When it was built we installed a salt chlorinator unit. We run the pump 24/7 and also have an inground cleaning system which we run daily. The water is great until it rains and our minerals get out of whack. However, we have been unhappy with the costs associated with adding special proprietary chemicals every time it rains due to a low mineral count. Could we just use salt like you have described for other units? Is it possible something is wrong with the cell in the unit? Your system is a salt chlorine generator, similar in action to many others on the market, including the inground models on this website. One product is merely a propriety salt mixture. You can use non-iodized, food grade or water softener grade salt and maintain it at the PPM level required by your equipment. Salt is usually only added once or, as needed, to replace that lost by backwashing, pump outs and splash outs. The other product is a proprietary mixture that claims to be useful for many purposes. The bottom line is that if you operate the system properly and maintain a free chlorine level of 1-3 PPM, about all you should have to do is control the pH and TA. If your water is hard or contains metals, adding a calcium or a quality, phosphate-free, metal treatment, such as Liquid METALTRAP, monthly, will help keep the cells and underwater water surfaces free of scale or stains. After periods of heavy rainfall, the chlorine level may bottom out. Adding a dose of shock and/or turning up the dial will restore the proper level, in most instances. If the unit is producing adequate chlorine, there would appear to be nothing wrong with it. I hope that this information proves helpful and a savings to you. Please tell your friends about the website. ► A Salt Chlorinator And An Ozonator? A local company is trying to talk me into adding an ozonator to my pool, which already has a salt chlorinator. Is this overkill? Is there any sense to doing this? Thanks for any input that you can share. Overkill? I used to think so, but now I don't this so. A salt chlorinator is a complete sanitizing system. By contrast, an ozonator needs a backup sanitizer, such as chlorine, bromine, an ionizer or a Solar-Powered Dual-Ion Purifier-Mineralizer. Therefore, if you have an ozonator, adding a salt chlorinator can make a lot of sense. If you have a salt chlorinator, adding an ozonator will allow you to lower the settings and extend the life of the cell. This, in turn, will further reduce the overall chemical presence. Definitely a case of more being better. I hope that I have been helpful. Would a Salt Water Generator be advisable for use in a fiberglass pool? Also, as we are gone for 5 months a year, what problems would this present with the maintenance of the system? Do all SW generators need to be acid washed? We plan to cover the (8.5x18x5ft deep) pool with a 4" thick spa cover, and to keep the pool at approx. 87-90 degrees. Would this effect the ability to use the SW generator effectively? Thank you so much for sharing your knowledge. There's no reason that a saltwater chlorinator shouldn't be used with a fiberglass pool. Many salt chlorine generators have self cleaning cells, which I assume relates to the "acid washing" that you are referring to. You should be able to select a low setting and have it controlled by a timer. Once the organic matter in the pool is destroyed, very little chlorine will be required to maintain the pool. I suggest that you have someone periodically check the water level, chlorine and pH levels. Otherwise, salt chlorinator operation is highly automated. Have you given any thought to covering the pool with an automatic pool safety cover? It is much safer than what you are proposing, as this type of cover can support the weight of a person. It can be retracted at the press of a button, act as a solar cover, reduce evaporation, reduce chemical usage and help keep out debris. I hope that I have been helpful. I have a in-ground vinyl pool with a salt chlorine generator I installed at the beginning of the summer. The water has been clear all season but I have now (after two weeks of not using the pool) noticed a yellowish staining in the steps and around the rim (bathtub ring and below the waterline). It does not scrub off so I do not think it is algae. I have kept the chlorine levels up so I would doubt algae could form. This must be some kind of scaling...How do you get rid of the stain? I bought some Scale Remover but after looking thru the salt generator owners manual, it made reference to a "saturation index" and mentioned that anything over .2 could cause stains. I did some calculations and determined my Saturation Index to be 0.270. What would try to adjust first? My Alkalinity is 119, my pH is 7.5, my Calcium is 250 and stabilizer is at 60. My first thought is to take the Alkalinity down a notch and use a metal remove to get the Calcium lower; both of these adjustments should take the Saturation Index down closer to 0.0 Any thoughts or advice? Thanks. Scale consists of calcium carbonate deposits and should not be yellowish in color. Your water chemistry is only very slightly towards the scaling side, of the optimum range, and should not be causing the problem. Adding a metal treatment or calcium treatment will not lower the hardness: it will complex calcium and allow more to remain in solution without problems. Lowering the pH and/or the TA will lower the Saturation Index. This problem does not seem to have any direct link to the use of a salt chlorinator, as it is common in pools without salt chlorinators. The stains and discolorations could be the result of iron or other metals. That being the case, chlorine will not work. Shut off the filter, put 1/2 pound of pH reducer in a white sock and drop onto a stained area. Hopefully, as the acid dissolves the stains will be removed. Afterwards, use a scrub brush to help expose the surface and repeat as needed. If this works, but the area is too broad, lower the pH of the entire pool to about 6.0. Once the stains have been removed, add a double-triple dose of a quality, phosphate-free metal treatment, such as Liquid METALTRAP, prior to restoring the pH. Add at least 1 dose for each 0.5 PM of metals and allow 8 hours to work. In any event, add at least a double dose. Allow the water to recirculate for 8-12 hours after the metal treatment has been added and before the pH is raised. I suggest that you have the pool and tap water tested for iron, copper and manganese, as it may be necessary to treat the water monthly or whenever new water is added. If this does not work, try placing a few vitamin C tablets on the stain and let dissolve. If this works, lower the pH to 6.5 and add a chlorine neutralizer to discharge all chlorine present. Add a dose of METALTRAP Stain Remover and allow to circulate overnight. Use the amount recommended on the package. Do this only if the vitamin C tablets worked! Depending upon the nature of the problem, additional product may have to be added. Before raising the pH and chlorine level, add a double dose of Liquid METALTRAP metal treatment and wait 1-2 days. As you raise the pH and chlorine, take notice of the water quality, as more metal treatment might be necessary. Good luck. You were correct about metals in the pool: I just had the water tested again for copper & iron and they are reporting the copper level to be 0.17 ppm which looks to be off the chart high. I need to get my well water tested as it looks like I'm putting in more metal at each top-off. Thanks so much for your help on this. ► Unit For Above Ground Pools? 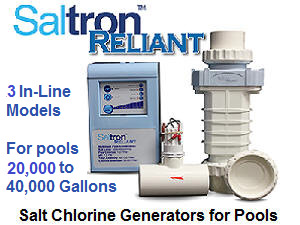 I am looking into saltwater chlorination for above ground pools and would like to obtain more detailed information on the Mode SR Salt Chlorine Generator. This item seems to be a cost effective solution for an above ground pool. As a minimum, what water capacity can this item handle? The pool I am interested in is a 16’ x 33’ x 52” and is about 20,000 gal. How do you install this item? It does not appear to be inline with the filter pump. Does this item require additional accessories or is it stand alone? Regards. The Model SR Salt Chlorine Generator unit, requires minimal installation and no plumbing. 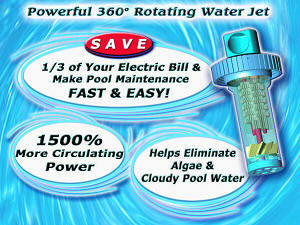 This salt chlorine generator is designed for above ground pools, up to 20,000 gallons in water content. Your pool actually contains 17,150 gallons, according to my calculations. It does not require connection to a pump. It hangs below the top of the pool, allowing for water to flow through the cell. All you need to do is plug it into a 110 volt, GFI protected outlet. It will require that salt be added to the pool water. Other than that, it is maintained like any other chlorine pool. I hope that the information will prove helpful. ► Is Well Water A Problem? I am having a pool installed this fall and wanting to go with the salt chlorinating system. I talked to a pool guy that is giving me one bid for the upcoming pool and he said that the cell would go out faster than normal because I am on well water not city. Any comments. Thanks. If your well is of potable water quality, it is doubtful that it can make any measurable difference in the life of the cell. In either case, chemicals will be added to the pool to adjust the water to the desired water chemistry. If your well water contains high level of calcium and/or heavy metals, it should be treated appropriately. The best way to treat a pool, such as yours, is with the METALTRAP Filter. Simply attach the METALTRAP Filter to the garden hose that you are using to fill the pool. It will remove iron, copper, manganese, other heavy metals and fine particulates. By removing the heavy metals, you virtually eliminate discoloration and staining issues. Use the METALTRAP Filter on all new water added and you'll avoid adding metallic ions that might cause problems. Monthly doses of the Liquid METALTRAP product will pick up and lingering heavy metals and will help keep the salt-cell cleaner. Ask him why it makes a difference, as I am eager to hear this! Will a salt water pool harm my trees, plants and fescue grass? Thanks. It is never a good idea to drain any kind of swimming pool onto landscaped area. However, sometimes there is no practical choice. Normally the only water drained is that from backwashing, pump out or winterizing and is done on an occasional basis. Salt chlorinators require a few 1000 PPM of salt and this, generally, is well tolerated by the landscaping, especially if the drainage is good. In areas, where drainage is very poor and/or rainfall totals are very low, some effort might be made to minimize and disperse the discharges. Potassium chloride has been used, in place of sodium chloride, out of consideration for this problem. Thirteen pounds of potassium chloride are required for every 10 pounds of sodium chloride. No one has ever written to me describing the effects of this concern and, therefore, I surmise that most people should not expect to have a problem, if some precautions are taken. I hope that I have been helpful. ► How Does Salt Become Chlorine? Could you possibly explain how the compound sodium chloride is converted to a Chlorine. I am interested in seeing how and why it occurs molecularly. I am a pool repair person and have had the question raised, but have not been able to give a complete answer. My thanks in advance. In a swimming pool the chlorine forms hypochlorous acid (HClO), the active germicidal form of chlorine. Electrical energy is required to initiate the oxidation-reduction reaction, necessary to covert salt into hypochlorous acid. The salt chlorine generator provides the means to make this conversion. I hope that the information will prove helpful. ► Testing The Salt Level Of Pool Water? I have a service route and come across quite a few salt chlorinator systems. My question is how important is it to maintain the proper level of salt? How is it tested? Thanks. Very important! Low salt levels can result in low chlorine production. High salt levels can result in overproduction and shorten electrode life expectancy. Testing is simple, as the there are a variety of testers and test strips available. The newest and, perhaps, the simplest, is the TRACER PockeTester. 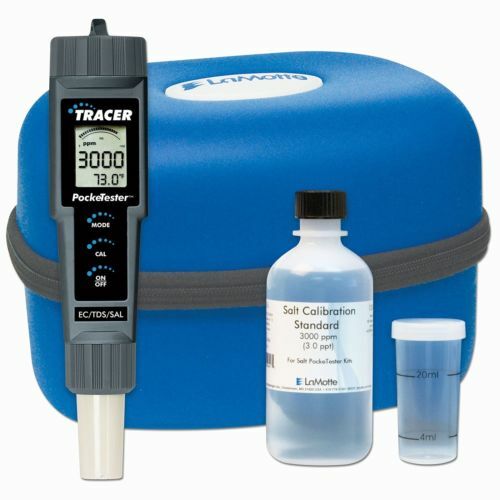 Designed for the pool professional, but inexpensive enough for the caring pool owner, the Tracer PockeTester measures Sodium Chloride with a range from 0 to 9,999 ppm; TDS with a range from 0 to 9,999 ppm; Temperature from 32 to 149 F. The tester’s probe is dipped into a sample of pool water and the results are ready in seconds. A microprocessor allows for easy push button switching between TDS and Salt. I hope that the website has been helpful. ► Mineral Sanitizer And Salt Chlorinator? I have a new pool is slowly being filled with water right now. I have both a mineral sanitizer and a salt chlorine generator. I am having trouble deciding which one to use. The pool company that put the pool in says the solar-powered mineral sanitizer system is better. My friends that have pools say to go with salt. I just want to know which one will be easier to use. And if I choose the salt will my water have a salt taste to it. Which one do you recommend, and which one helps to make pool maintenance easier. My pool is in Southern California. Thanks. Your pool will not have a salty taste! Just a Solar-Powered Dual-Ion Mineralizer will not be enough. You will still need to add chlorine to oxidize wastes. I would use the salt chlorine generator as the primary means of sanitizing and oxidizing. Use the mineral sanitizer, as a backup, and it will allow you to favor the low end of the recommended 1-3 PPM free chlorine range. Because you will be producing less chlorine, the pH will be easier to control. The combination of the two will make for better water quality and less maintenance. I hope that I have been helpful. Enjoy the pool. ► Pool Pump Size Considerations? I am building a pool in Mexico and am convinced that a salt-water chlorinator is the way to go, perhaps combined with an ozonator. I have two questions: 1. Does salt-water chlorination process have any corrosive or other detrimental effects on equipment (such as the pool pumps) over time, and if so, is there anything that can be done to minimize these effects? 2. I've received various recommendations concerning the size of the filtering pump I should use, relative to the size of the pipes (i.e. use 1/2 HP for 1.25" or 1.5" pipes), but I'm wondering how this ties into the salt-water chlorination processing requirements. My pool will hold roughly 8,000 gallons and I want to run the pump as little as possible (for maximum energy conservation). If I use a larger pump to reduce the number of hours it runs each day, how will this impact how much chlorine is generated relative to the amount required? The bottom line is that I want to make sure I have the appropriate balance between pump power, pipe size and chlorine generation for optimum efficiency and lowest possible maintenance. Any advice you can offer would be greatly appreciated. Thanks again for providing such useful and accessible information. Salt chlorinating systems do not normally present a corrosive situation, unless two dissimilar metals are in immediate proximity to one another. Salt Chlorination has become so popular today, that is extremely unlikely that you will experience problems, using the products in current production. Too big a pump can reduce chlorine production. There doesn't seem a need for you to exceed 1 HP, with 1-1/2" pipe. Energy consumption comes down to watts times hours. You should plan on operating the filter for 6-12 hours a day, depending upon temperature, usage and other circumstances. Trying to lower the filtering time, to a conservation-minded, short cycle, will, also, shorten the time that chlorine and ozone are being produced, and that operational practice could lead to algae problems and poor sanitation. Remember, sanitizer is only produced when the pump is on! The combination of salt chlorine generation and ozonation should prove very effective. I hope that this information proves useful. ► Needing A New Salt Cell? I have had a saltwater chlorinator for a bunch of years and of late I seem to need to add some chlorine. Could this be because the cell is worn out? Can it be regenerated or does it have to be replaced? Thanks for the help. There are several possibilities. Check the salt level, it may be too low. Your cell may have to be cleaned with an acidic solution. This is especially true, if your saltwater chlorinator does not have a polarity reversing, self-cleaning feature. Otherwise it is possible that the cell needs to be replaced. Evidence of corrosion of the plates can be confirmation. Some retailers offer replacement cells for a wide variety of units. If, in addition to the salt chlorine generator, you utilize a Solar-Powered Dual-Ion Mineralizer, you will be able to operate the salt chlorine generator at a lower setting and this will extend the life of the salt cell. In addition, it will provide some sanitizing backup to carry you through periods of heavy bather usage. I hope that I have been of some help. ► Won't Do Without One? I live in Houston. We are starting the process of getting quotes to build a new pool. My sister in Chicago has a pool ionizer. I have never seen anything as easy as this. Every season they put a few bags of salt in the pool when they and the ionizer makes its own chlorine. They rarely have to add anything. Is it possible to have this system in the hot humid weather that we have here in Houston? I do not want a pool that is not an ionizer. Can you help me in finding a pool company in our area that will install this system with maintenance service? Not a problem! The product that you are referring to as an "ionizer" is more correctly described as a salt chlorine generator system. That's why some salt is added yearly: in order to replenish the salt content, after the pool water level has been restored in the springtime. An ionizer is something different: it uses copper and silver ions, in conjunction with shock treatments, to maintain proper water quality. An ionizer does not make chlorine! A salt chlorine generator system can produce all of your pool's chlorine requirements, with a minimum of other chemicals. It is like having a chlorine manufacturing plant. Chlorine output is controlled by a setting on a dial and is making adding pool chlorine the old fashioned way obsolete. It works in the humidity of Florida and the Arizona desert. Having it installed in Houston is as simple as going to a manufacturer's website. Using a dealer locator will help you find a local company. You'll, also, find a lot of product information on their website. Good luck with the pool. I was browsing through the information on mustard algae and came across pool automation. If we get a chlorine generator, can we use an automation control to regulate the chlorine level? The website was really helpful. Thanks for making it available. A pool automation control can be used for pool accessories: filters, heaters, automatic safety covers, automatic pool vacuums and more. A salt chlorine generator is connected electrically with the same circuit as the filter. When the pump goes on, the salt chlorine generator is activated. The chlorine level can be regulated by varying the control setting on the equipment or by increasing or decreasing the filter run. There are devices than can control the actual chlorine level. If you are interested in reducing the time and effort, a Robotic Pool Cleaner and a pool automation system are a good means to accomplish this task. I hope that I have been helpful. ► Salt Chlorinators vs. Ozonators? Alan, how about ozonators versus salt chlorine generators? I have been told ozonators kill a wider range of microorganisms than salt chlorinators. Also, a friend with a salt chlorinator adds muriatic acid regularly to kill algae. Your opinions, please. Ozonators only work while ozone is actually being produced. There is no residual action. This means that ozone quickly leaves the water and that can allow for algae growth on the walls and in the corners. However, It needs a backup sanitizer to perform properly. Salt chlorinators are complete sanitizers and do not require a backup. It allows for easy control over the chlorine level and all water passing through the cell is super chlorinated. Having both salt chlorination and ozonation will allow for the salt chlorinator to be run at a lower production rate. This, in turn, will extend the life of the cell and reduce chemical usage. There is no sensation of salt in the water and little of the odor normally associated with chlorine. The addition of muriatic acid has nothing do with algae. It is being added to lower the pH of the water. I hope that I have been helpful. ► A Salt Chlorinator: is it salt water? I know that salt is added to the pool water and it is converted to chlorine, as it passes through a cell. Does that mean that the pool is now a salt water pool? Can you taste the salt? I like the idea of the product, but I don't like salt water swimming. Can you supply any details? Thanks. Salt is added to the pool water and I believe that a typical addition would be 20-25 pounds per 1,000 gallons of pool water. That is far from the salt level of ocean water (about one-seventeenth) and it is not nearly enough to taste. From my own experience, there is no sensation of salt water. Not in feel or taste. I hope that I have been helpful. ► Good For The Liner? I have a vinyl inground pool and am considering getting a salt chlorinator. I have been told that it will help maintain the appearance of the liner. Is someone pulling my chain? How can salt do that? Please explain. No one is pulling your chain! It has nothing to do with the salt and everything to do with the consistency of the salt chlorinator. Salt chlorinating systems are controllable and avoid big fluctuations of the chlorine level. It is the presence of high chlorine levels that can cause your liner to fade. Maintaining a steady 1-3 PPM chlorine level is good for the pool sanitation and safer for the liner. Manual addition of chlorine can cause upward spikes in the chlorine level, resulting in the potential to cause fading. Refer to the page on "Vinyl Pool Liner Problems." I hope I cleared things up. ► Above Ground Salt Chlorine Generator? Do you know of some manufacturers of salt generators for above ground pools. Which one do you recommend and why? Are they worth the cost? How about three that will cost under $400 and require little or no installation or plumbing. Two are even solar-Powered and can function as a mineralizer, as well. These Salt Chlorine Generators can be used for pools up to 15.000 to 25,000 gallons in size, depending on the model. No chlorine to handle or store, fewer problems and better water quality are just some of the advantages. Previously, cost was the big obstacle. Now it has become affordable, even for smaller pools. For more information about the I hope that I have helped you decide on joining the growing ranks of salt chlorine generator owners. ► Salt Chlorinator, Ozonator and Shock? What a fantastic website! Thank you very much. I've read through much of your site, and I'm still confused over the mixing, or not mixing of salt, ozone, and shock. I'm in the process of interviewing pool builders to get an inground pool, roughly 13-15000 gallons. As you could guess, each builder has his own idea on what is good and what is bad. Through independent research, I've concluded that the ozone system is a benefit, and the salt generator is also. This is especially important to me, since my 3 year old son has eczema. My main source of confusion is in shocking the pool. Is shocking required with a salt system? One builder says no, another says a chemical shock can be used, or put the generator in "shock mode" which lasts for 4 days. I believe I also read somewhere that salt generators do shock, but slow enough that it doesn't always work on some algae. Somewhere else, I read that you must perform chemical shocks with the salt, but not if you have an ozone unit. Yet another says the ozone does absolutely nothing, is merely a scam and, therefore, has no bearing on pool treatment. In truth, I just want what will be best for the family and my son's skin problems, regardless of the amount of work involved. Any guidance is greatly appreciated. Salt chlorine generators are pretty much a stand alone sanitizer. All of the water passing through the cell is "shocked" for all intents and purposes. The use of a supplemental shock is required only if there is a sudden loss of water quality, the bather usage is very high or there are signs of algae. Otherwise, effective control is achieved by choosing a setting. Under proper conditions, algae should be a rarity. Ozone is anything but a scam. Ozone is not a complete water sanitizer and should be used with a backup sanitizer, such as chlorine, bromine, Solar-Powered Dual-Ion Mineralizers or ionizers. Using a salt chlorine generator and an ozonator is of tremendous benefit. Both products will oxidize wastes and contamination. The salt chlorine generator will provide basic sanitation and act as a back up for the ozonator. The ozonator will allow the salt chlorine generator to be operated at a lower power setting and this will extend the useful life of the cell. Less chlorine will have to be produced, in order to maintain a satisfactory level because of the ozone. The need to use a supplemental shock would seem to be nil, unless the pool is totally neglected. Both salt chlorine generators and ozonators destroy the irritating, odorous and ineffective forms of chlorine. This combination is about as good as it gets and there will less work, less chemicals being used and stored and easier chemistry to maintain. If the cost is doable, it is worthwhile! I hope that I have been helpful. Good luck and enjoy the pool. ► Using A Sacrificial Zinc Anode? A manufacturer of copper solar collectors has recommended the use of inline zinc anodes bonded to the collectors by a solid copper wire to prevent corrosion of the copper in saline pools with chlorine generators. Is this scientifically valid? Does salinity per se or the electrochemical effect of the generator create a more corrosive condition for copper than conventional chemical maintenance in freshwater pools does? I am aware of but do not want to use poly plastic collectors for several reasons not related to corrosion. Thanks for your advice. The use of the Sacrificial Anodes are more like a tool, than an absolute necessity. Still, it can add a degree of corrosion prevention. If you have a bad bonding wire/grid to the pool, the anode will sacrifice itself to deterioration, rather than other metals like the handrail, ladder, light niche, heat exchanger. This is more of a protective item, if you are uncertain as to the bonding of the pool. Again, this is not a necessity with salt systems. It does not hurt to have it, and if you see there is no degradation after several months of it, your pool is probably well bonded. If corrosion or maintenance is an issue with stainless steel ladders or rails, if can be completely avoided, with the ladders, rails and steps made of Composite Materials. These composite products do not have to be electrically bonded, as they are non-conductive. I hope that this information will be helpful. ► Hard Water As A Factor? Hi Alan. The water in our area is very "hard". It leaves hard, white build-up on the tile of the pool. Will a salt chlorination system help eliminate or significantly reduce the amount of build-up on the tile? Thanks for your time and expertise. Good question! Adding a salt chlorinating system will require that about 2500-4000 PPM, depending upon the manufacturer's recommendations, of sodium chloride be added to the pool water. While, this will not increase the hardness level of the water, it will increase the Total Dissolved Solids (TDS) of the water; which in turn could reduce the solubility of some of the minerals in the water. The good news is that the salt chlorinating system will reduce the amounts of other chemicals needed to maintain water quality and will reduce the buildup of chemical byproducts, that are more likely to cause problems. All you should need to maintain the pool is an occasional dose of muriatic acid to lower the pH. Because the water is hard you might want to add a monthly dose of a calcium sequestering compound to help prevent scale formation. As a bonus, it will help keep the salt chlorinating system's electrode plates clean and free of scale. I hope that I have been helpful. ► Salt Chlorine Generator and UV Sanitizer? I am a physician who lives here in Connecticut with my two children, ages 6 and 9, and my wife, who are all very blonde, and end up with green hair after a few short weeks of swimming. I have a chronic shoulder injury that requires that I swim in 90 degree pool water. My in-ground pool is 18x42, is heated by a propane heater, and it has an automatic pool cover. I am looking into an electronic chlorine generator and combining it with a UV sanitizer. I ruled out ozone generators because of the automatic cover, which covers the pool most of the day, as I am afraid of the accumulation of gas that my family may breathe in. What do you think of the combination of salt generator and UV sanitizer, considering that the pool is 90 degrees from June through September? I look forward to your reply. First let's discuss the green hair. At about the time I was transitioning from life as a cosmetic chemist to a specialty pool chemicals manufacturer, an article about "green hair" was published in the Journal of the Society of Cosmetic Chemists. It attributed the problem to the presence of copper from copper sulfate, natural sources and corrosion of copper components, as opposed to the use chelated copper algaecides. You have a heater and you probably use trichlor tablets in a feeder. Trichlor is acidic and if the water remains in an acidic state for prolonged periods of time, copper corrosion will follow. You should have the water tested for copper. Whether it shows up or not, add a double dose of a quality metal chelating agent, such as Liquid MetalTrap. Not only might it help prevent more green hair, but it will help keep the salt chlorine generator cell free of scale deposits. You can use a salt chlorine generator without a UV sanitizer. You cannot use a UV sanitizer without chlorine, bromine or ozone. UV is not a persistent sanitizer, is not an oxidizer and has no residual effect. Chlorine is all of those things and more. The advantages of combining the two sanitizers is that you should be able to lower the chlorine level, while assuring that the return flow is free of viable microorganisms. I see this combination as ideally suited for a high bather load and high temperature situation. You must have a sanitizer, like chlorine, present in order to destroy microbial growth on the underwater surfaces. Once you have a salt chlorine generator installed, the pH of the pool water will tend to remain high. Acid conditions will be a thing of the past and so should copper corrosion. Some of the negatives about chlorine will also to things of the past: there will be less odor, less irritation and more consistent chlorine levels. If it ever comes to pass that you need a new heater, I suggest that you consider an heat pump. It will be less expensive to operate than propane, cleaner and there are models that do not use copper heat exchangers. I hope that this information proves helpful. I have been using bromine tablets in my pool for 9 years and really love everything about it except the cost and the 50# containers. I recently inquired about a salt bromine generator and the individual at the pool store stated that I can add bromine salt to a pool with a typical chlorine generator and that would work fine (I know that the chemistry is very similar but she wasn't very convincing). In addition one manufacturer's brochure did not state anything particular about such a conversion. Any thoughts? Thanks for any information that you can provide. If you add approximately 10-25 PPM of sodium bromide to a pool, that is being maintained on the typical pool chlorin e product, all of the chlorine will convert the bromides to bromine. The downside is that it cannot be stabilized or protected against the Sun's UV rays and can result in higher usage rates. Before adding sodium bromide, to a salt chlorinating system, check with the unit's manufacturer, as to their recommendations. It is possible that the bromides will have an adverse effect upon the life of the cell and could require a complete draining. It is, also, possible that sodium bromate could be formed and that may create adverse health considerations. A salt chlorinating system is capable of supplying all of the pool's sanitizing needs, without the addition of sodium bromide, and will avoid many of the odor problems associated with the usage of traditional chlorine swimming pool products. Generating bromine will force the need to produce more chlorine, because the bromine is more apt to be destroyed, by the Sun's UV rays. Chlorine can be protected, but bromine cannot. I hope that I was more convincing. Enjoy the season. ► Eliminating Previous Use Of Bromine? I have a 16x32 inground vinyl liner sport pool and was using bromine last year. I am switching to a salt water chlorinator and have been told many different things about whether I need to drain the pool completely or not to get the bromine out before the switch. The last suggestion was to drain the pool as much as safely possible (just above the sidewall bottom depth) and then to add chlorine neutralizer (or some other chemical to remove the bromine). Do you think this will work? Does this chemical really eliminate the bromine like they say? I really don't want to drain the pool completely to avoid liner problems. Thanks. Whoever suggested that you add a chlorine neutralizer to get rid of the bromine really doesn't understand what needs to be done. Chlorine neutralizer will eliminate bromine, by converting it to bromide ions. However, adding chlorine will cause the bromide ions to form bromine again. You have to eliminate the bromide ions and, in that regard, chlorine neutralizer is useless. The salt chlorinator cell might be adversely affected by the presence of bromide ions. The only way to totally eliminate them is to replace water. I suggest that you contact the manufacturer and find out their suggestions for dealing with this issue. It might not be necessary to remove all of the bromide ions, but you need to obtain this information. The presence of bromides will increase the need to produce more chlorine and could shorten the life of the salt cell. Good luck and I hope that I have been helpful. I have never owned a pool before and have just moved into a house with a 20k gallon pool. I think the pool and equipment are between 10 and 15 years old. I had the pool opened professionally, had the water tested and added 200 pounds of granular salt from the pool store. All indications on the unit are normal, but after a week the chlorine levels are almost non-existent (free chlorine .17 and total chlorine .2). Everything else (Alkalinity (90), pH (7.35), Calcium Increaser (113), and Chlorine Stabilizer (80))are in the normal range. I then found out that the previous owner had converted from a chlorine to bromine system at some point. Not sure where to go to from here. I understand that I am supposed to add bromine. If so, how much, is there a special type, was adding the salt a mistake or was there a special type of salt that should be used. Appreciate any information. Thanks for the help. Salt chlorine generators are designed as a chlorine generator, but can be operated as a bromine generator with the addition of sodium chlorine and sodium bromide. However, because bromine cannot be protected from the Sun's UV rays with stabilizer, the salt cell output will have to be higher and this will shorten the cell life. At pool opening time it is common for the pool to have a high demand for chlorine or bromine. I suggest that you keep adding granular chlorine, until the free chlorine is 1-3 PPM. In reality, the chlorine (hypochlorous acid) will convert to bromine (hypobromous acid). When testing as bromine, the level should be 3-5 PPM. Hopefully, at that point, the unit will be able to continue to meet the demands of the pool. To maintain the pool on bromine, after adding the normal salt amount, add 2-4 lbs of sodium bromide. Thereafter, add 2-4 lbs of sodium bromide, for every 50 lbs of sodium chloride (salt) added. Bromine does afford some advantages: less odor and irritation, more flexibility with the pH and better performance against certain types of microorganisms. Good luck with the pool. We just bought a house with a pool that has an salt chlorine generator. The previous owner replaced the cell recently, but didn’t adjust the chlorine production, thus the chlorine level is really high. We’ve turn off the generator for now, but I wondered if there was any other way to lower the chlorine. Please let me know. Shutting off the salt chlorination system was the right first step. Without having been provided with specific details and not knowing where you are located, there are several options. If the pool is not vinyl, you can safely allow the chlorine levels to drop by themselves. Make sure that the filter is operated for normal periods of time. If the pool is vinyl or you would like to quickly get the level down to a more comfortable level, you can add a chlorine neutralizer product. Most pool dealers carry the item. It is used to reverse the effects of massive over chlorination. Use as directed and once chlorine level has been optimized, you should resume normal chlorination. I hope that I have been helpful. Hello, I would greatly appreciate your opinion on salt water pools. I am installing a pool this summer and I can't make up my mind about going with a saltwater chlorinator. I have some apprehensions mainly because of possible corrosion damage. Have there been many problems with salt chlorinators and are they low maintenance. At the end of the day I guess the question I have is, if you were installing a pool would it be salt water. Regards. I have had years of experience with a saltwater chlorinator on my pools - both in New York and Florida. Corrosion was never a problem, unless there were different metals in close proximity to one another. I did have some trouble with the underwater lights and had to have the metal bolts replaced. Other than this there were no other corrosion problems. It is a low maintenance item and greatly reduces chemical handling. Imagine being able to control the chlorine level with a simple turn of a dial. Yes, I would do it all over again! Good luck with your choice. I am thinking of changing my pool over to a saltwater system. I was wondering which techniques are the best for stabilizing the pool when you have a saltwater system, or does a saltwater system stabilize itself? Thank you. With a salt chlorine generator, all you need to do is add an initial dose to stabilizer to bring the level up to 40-60 PPM. Thereafter, more stabilizer is needed only to replace that lost through pump outs, backwashing and splash out. The overall water chemistry should be maintained in the usual manner. Because salt chlorinators destroy chloramines so effectively, you will find the swimming conditions more pleasant and easier to maintain. I hope that I have been helpful. ► From Chlorine To A Salt Chlorinator? I am changing my pool to a salt chlorine generator type and I was wondering if I need to do anything to the chemical chlorine already in the water solution, before adding the salt and starting-up the generator. Thanks. You might want to check the stabilizer level. If too high, above 100 PPM, you might want to replace some water before adding the salt. A range of 40-60 PPM should be adequate, to help protect the chlorine against the Sun's UV rays and allow the salt chlorine generator to operate more efficiently. Otherwise, the water chemistry should be maintained, as before. I hope that this information is helpful. Please help me! I recently drained my NEW pool after being sold chemicals at the pool store that made it look like 2% milk. Here is my problem. It is a 25,000 gallon saltwater chlorinator system. I added 750 lbs of salt, stabilizer, and acid to get it fired up for the first time...it has been superchlorinating for 30 continuous running hours so far. After the initial 30 hours, I have it set to run 7 hours a day. The pool store said I needed to superchlorinate every day for the first seven days. I am worried about doing this being that after the first 30 hours I have a 3 ppm free chlorine reading, 3 ppm total, 7.8 pH, and 180 alkalinity. My limited pool knowledge tells me to set the chlorinator to its normal low setting, due to it being in its acceptable range already and stop superchlorinating. Unless there is a specific advantage to going all week for startup, wouldn't this make the free chlorine reading skyrocket, if I kept superchlorinating? Should I only adjust the pH and TA with muriatic acid and turn down the chlorinator. My 4 in 1 kit tells me to add 1.15 quarts of acid to bring pH down, and the same kit says add 12 quarts of acid to bring down TA. Which should I do? Have I given the pool enough time to get an accurate reading? I am hesitant to go the national pool store that has been helping me due to prior weak advice. Thank you for your help. If your water is clear and there are no signs of algae on the walls, there is absolutely no reason for you to continue to operate the saltwater chlorinator system at a superchlorination setting. Your free chlorine level is at the high side of optimum and the combined chlorine is zero -- meaning there probably is no algae problems. You are correct, in surmising, that continuing superchlorination will only cause the free chlorine readings to become unacceptably high. Operate the equipment to maintain a free chlorine level of 1-3 PPM. I suggest that you control only the pH and keep it within 7.2-7.8. So long as you are not experiencing cloudy water, due to the combination of high calcium hardness levels and high total alkalinity, there is no compelling reason to have to lower the TA. Perhaps there was a misunderstanding in the advice that was given, but clearly it was inappropriate. I hope that I have simplified things. Enjoy the pool. ► Potassium In Place Of Sodium? Will a salt system function the same if I use potassium salt? It seems that it is only recently that I received the first email on this topic. Potassium chloride (KCl) can be used in place of sodium chloride (NaCl), as the chloride ion source, with salt chlorinating systems. However, the appropriateness of its use should be checked with the manufacturer of the salt chlorinating product. It cannot be used, as a salt substitute, on a pound for pound basis. For each 10 pounds of sodium chloride required, 13 pounds of potassium chloride will be needed. Periodically the water should be tested for chloride content and adjusted to the level recommended by the manufacturer. One of the reasons given for using potassium chloride is to avoid possible damage to landscaped areas, due to the sodium content. However, too much potassium, added to the soil, would also be a problem. I hope that this information proves helpful. Enjoy the holidays. ► Scale Deposits On Salt Cell? I believe you may be able to help me with my question. What is the chemical make up of the scale that accumulates on the plates of a salt water pool chlorinator used in a back yard swimming pool? Thanks for any help you can give. The scale consists of calcium carbonate, in virtually all cases. A self cleaning unit should help avoid the problem. Otherwise, the cell needs to be cleaned, according to the manufacturers, instructions. Using a mildly acidic Cleaner or vinegar can help avoid and control the buildup. I hope that this information proves useful. Alan. My chlorinator is only developing a minimum of chlorine. I have tested and added salt, checked the fuse cleaned all the strainers and filters and checked the impellor of the pump for blockages. Flow level and circulation are good. Pulled the cell apart and found that 50% have the deposit of salt on them while the other 50% are bright clean. These are alternate to the dirty ones. Pulled the control box apart and have found no obvious burnt out wire etc. Where and what do I look for next. Regards. The plates with the debris (probably calcium carbonate) are the negatively charged ones. There are two possibilities. The unit is either intended to be cleaned manually or, if it has a polarity reversing feature, it has a defect in this circuitry. I suggest that you refer to the owner's manual or consult with the dealer, as to which possibility is most likely. I hope that this information will prove helpful. ► Winterizing With A Salt Chlorinator? We are putting a pool in this summer and would like to put in an in-line, plumbed-in, salt water chlorinator. Our builder does not have much experience installing them in our area (Burlington, Ontario) and is worried about how they will stand the test of time in our climate. What are the negative effects of a salt water pool in the Ontario winters. First let me set something straight. You will not have a salt water pool. You will have a pool, to which some salt has been added - an amount far less than real salt water. A salt chlorination system should be winterized, along with the entire pool. The cell should be removed and the lines blown-out and capped. The controller can be removed and, along with the cell, stored indoors for the winter. No other special considerations are required. Enjoy the pool! ► Yellow Prussiate Of Soda? My pool has just been completed. It's a plaster pool filled with city water. I have a salt generator. I bought the salt from a pool store, just to realize that it contains yellow prussiate of soda. I m wondering what are the consequence on the plaster, the salt generator and other and if I should replace all the water? Thank you for your time. In some instances this can be a serious problem and for that reason I urge people to use only non-iodized food grade or water softener grades. Never use rock salt or industrial grades! In your case, I suggest that you add a double dose of a quality, phosphate-free, metal chelating agent, such as Liquid MetalTrap, ASAP. It should help prevent discoloration and as an additional benefit will help keep the salt cell plates free of scale. Your water is soft and should not present a major problem, as it probably does not contain heavy metals. If your water had been hard, with metals present, this would have been adding fuel to the fire. Evidently this pool dealer has not experienced problems because of your local water quality. Next time you need to add salt, I would use a better grade. I install pools in Michigan and just started installing salt/chlorine generators this year. Some of my customers are getting shocks from the pool and decking or hand rails, sometime only from one side of the pool. It seems to be a bonding issue with the coping? How do they bond a pool, say in Florida, where they have used these longer than we have? Any Info or contacts would be greatly appreciated. Thanks. In Florida, the rebar is bonded before pouring the concrete deck and pool form, as are the light niche, ladders and handrails. You can try turning off devices from the main circuit breaker to see what may be causing the electrical shock. If you get to the point that all the devices are turned off and you still feel a shock, it may be the utility company's problem on the main grid. Ground is often mixed with the neutral and the result is a shock. Regarding salt systems, there should be a bonding lug on the base of the control unit. Make sure this is wired to the main bonding wire (commonly connected on the pump's motor housing too). I suggest that you consider consulting a licensed expert, to help determine a cause. I hope that this information helps. Hello Alan, I find your website very informative. I have a saltwater chlorinator solid cell. I see that the new cells these days are now self cleaning through reverse polarity action. Will I damage my current cell if I reverse the polarity to self clean myself? Appreciate your time and look forward to your reply. Regards. A good question: one that I had to seek some expert advice on. This will not work because the plates are not bi-polar. Each plate, in a manual system, is either positive or negative. What it will do is damage the cell. That is why each side has a different size plug, so you can’t hook it up incorrectly. Chalk it up to progress, but the newer units with polarity-reversing features are clearly better. Still any salt chlorinator is better than adding chlorine the old fashioned way! I hope that I have been helpful. ► Salt Chlorinator And An In-Line Feeder? We recently ordered an inground pool kit which came with a standard in-line chlorinator. We also purchased a salt chlorinator. Can both be installed and if so, in what order? Regards. If you have a salt chlorinator you should not need the in-line chlorinator, as it will serve no purpose. The salt chlorinator should provide all of the pool's chlorine requirements. If more chlorine is quickly needed because of visible algae, heavy bather usage, heavy rainfall, the in-line chlorinator will still not be useful, inasmuch as what will be needed is a quick-dissolving shock. I suppose that it can be installed as a backup. However, it doesn't appear to me that placement is an issue. To be on the safe side and not to void any warranty, check with the salt chlorinator manufacturer. I hope that I have been helpful. Enjoy the pool! The function of the "must sit vertical" is for the GAS TRAP to work properly. Most Australian units use a gas trap, rather than a flow sw itch, used in American Engineered units, to detect if there is sufficient flow or not. If not, the gases produced from the cell will form an air gap that disconnects, the conductivity of electricity from a cell blade to another electrode sensor. Once it sees this "open circuit" condition, it will shut off power to the cell. With the cell not exactly vertical, you would have to determine, if it's off center enough to affect this gas trap protection. The problem, with the gas trap protection, is that it is accumulating hydrogen gas, which can explode under the "wrong" conditions. I suggest that you contact the manufacturer of the salt system to see, if 20 degrees off, is acceptable. It is obvious that to operate properly, the salt cell must be securely screwed into the fittings. In-line salt chlorine generators utilize a flow detector and can be installed in horizontal to vertical positions, unless otherwise specified by the manufacturer. I hope that this information is helpful. ► Zeolite and A Salt Chlorine Generator? We have looked up a zeolite product and are considering using it in our sand filter. We couldn't find anything that said if it was OK to use the zeolite with a salt system. When we went to a pool product store, they didn't really know about the salt system. Before we invest in the this product, we would like to be sure it can be used in all sand filters and with the salt system. I'm sure I have been backwashing too often, and will not do that anymore. I always felt that if I got the filtered particles out, they for sure wouldn't recirculate back into the pool. The pool is looking better already, but the sand should be replaced sometime soon. Thanks again for all your help! Good question and a surprise answer! Yes, you can use a zeolite, to replace the sand, and a salt chlorine generator, together. In fact, it makes it better! Zeolite has to be periodically regenerated with a salt solution. If you have a salt chlorine generator, it never has to be done. Enjoy the summer.